One of the newest acronyms circulating in I.T. circles is the term BYOD—Bring Your Own Device. And as much as it might sound like an invitation to a social occasion of some sort, BYOD is really a wakeup call to beware your own downfall, so to speak. Or your firewall's downfall, at least. That's because BYOD—the practice of bringing personal devices into corporate workplaces where they are used to connect with the business's wifi, its networks, and its internal processes—is a practice that is fraught with security risks. 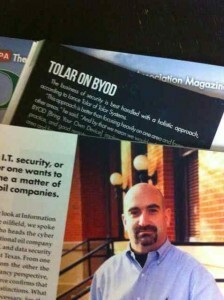 Interviewed recently on this subject by PBOG Magazine, Lance Tolar of Tolar Systems explained the phenomenon and its implications in the business world. The infiltration can go straight to the heart of the organization because it’s behind the firewall, Tolar said. Protecting against breaches caused by BYOD are actually more easily handled than most business people would likely expect, and so the risks that are confronting businesses every day are quite unnecessary and fairly easily confronted. But it generally requires the help of a trained technician or consultant.